There′s nothing sadder than someone who′s never gone crazy over something before, and there′s no moment more delightful than that moment when you realize time has flown past while you were occupated with something. G-Dragon, the member of Big Bang who recently made a comeback with his first solo album in three years, has gone crazy before, and is still crazy now. He′s so crazy he even gave the title Crayon to his new single, which stands for ′Cray (crazy) + Yong (′dragon′ in Korean)′. He was, of course, crazy about music when he made his debut as a singer, but even after all this time he still can be said to be a man crazy about music. This is why so many people look forward to seeing G-Dragon perform alone onstage as much as they look forward to Big Bang′s next songs. As if he didn′t want to miss the chance to impress, G-Dragon promptly came back with a new album this September 2012, and packed it with songs of G-Dragon, by G-Dragon, for G-Dragon. He seemed pretty satisfied with his new album, but it also seemed he would give One of a Kind from his second solo album full marks. That′s how confident he was about the quality of his album. Of course he does have his concerns: he′s worried about how long these good times will last. “You never know what will happen. If people say I′m at the top, then I must be doing well. I hoped people would see me that way, and so it means I fulfilled my dreams faster than others and I can dream bigger dreams now. It′s just that since I don′t know what will happen tomorrow, I have to prepare for the future that will come 10 or 15 years later starting now. He even said to a question asking him whether he was happy now, “I′m happy,” with a laugh. This singer was unexpectedly positive. He said he even tries to pass up the stress that keeps piling up on him. In the hour long interview, G-Dragon showed that he knew how to love himself, and knew how to enjoy his music. Everything depends on how you think about it. It may seem obvious that G-Dragon would be happy, as he is successful as a singer, but many doubt whether it is true happiness. G-Dragon continues to mature inside amidst such attention as much as his music, as he crosses the line from boy to man. “The reason I′m happy these days is because even I′ve started to think I′m crazy. I admit, I do look crazy onstage. I′m happy that I can be crazy onstage,” he said, and added passionately that only music makes G-Dragon whole. 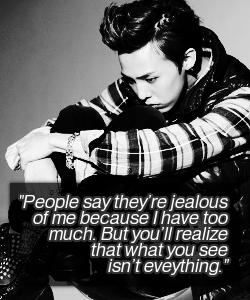 This mindset is why G-Dragon′s ′crazy′ second solo album is worth listening to.